The very first record I bought featured the Irish tenor banjo of the legend, Barney McKenna of The Dubliners, playing The Cook in the Kitchen I had the bug! The tenor has always been popular in Irish music and probably dates back to the American minstrel shows of the 1800s, when many of the stage banjo players were either Irish or of Irish descent. There were many great early Irish music recordings from New York in the 1920s featuring tenor banjo, including the ever lively and effervescent Flannigan Brothers. After a brief and exciting start with the electric guitar in the mid-70s, I started playing Irish music on the mandolin electric, with a wah-wah pedal of course! Growing up in Sligo, Ireland in the mid 70s proved to be a traditional musicians Mecca. I had the great fortune to play with musicians of an older generation who had real connections with the legendary Irish musicians of the early 20s: the great Joe ODowd, Fred Finn and my uncle, Barry Ward (Fiddle); Josie McDermott, Packie Duignan, Peter Horan and my other musical uncle, Jackie Conlon (Flute). Musicians of my own generation included: Loretto Reid (Tin Whistle), Maurice & Brian Lennon (Fiddle & Flute), Sandy & Rick Epping (Fiddle, Mandolin, Concertina & other things! ), PJ Hernon (Accordion), as well as constant and numerous sessions with visiting musicians, including many American Fiddlers and Banjo players who would come to see Joe ODowd or stay with members of the great band, Pumpkinhead, who lived in Sligo for some years. One of these musicians landed at the Trades Club in Sligo for a session one Tuesday night and brought along an old Vega White Lady Tenor. I got to play it that night and my search was on! I took up the banjo as soon as I could get one, and that turned out to be a new German made Hofner from Charlie Byrnes of Dublin. Upon finally arriving in Canada, I could now get my greedy mitts on some beautiful vintage tenor banjos! 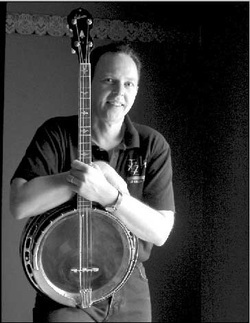 I have always been fascinated with the American banjo traditions and jumped at the chance of playing with Arnie and the two Chris's. Their magical musicianship and friendship have given me much inspiration, long live the rattle of the Banjo!